White House Chief of Staff John Kelly took a walk up to Capitol Hill on Wednesday to help lawmakers get a sense of what President Donald Trump was looking for in an immigration bill to protect recipients of DACA protection. In doing so, however, he made several remarks (later confirmed and repeated by the general in a Fox News interview) that reportedly angered the boss. 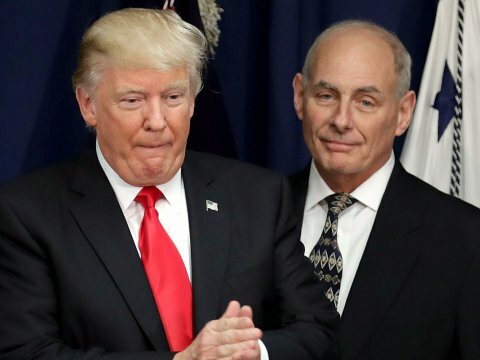 According to an initial report by the Washington Post, the chief of staff said that the president had made some statements about immigration on the campaign trail that did not necessarily hold true today. “Certain things are said during the campaign that are uninformed,” he said. “Concrete wall is not a realistic solution in many places,” Kelly conceded, saying that a “physical barrier in many places” would suffice for the administration. He told Congress that “we need 700 more miles of barrier” on the border, but increased manpower and drone surveillance would be fine in other areas. Whether Kelly did or did not accurately convey Trump’s current thinking on the wall, it was reportedly his insistence on telling lawmakers (and then the Fox News watching public) that Trump’s position had “evolved” that raised the president’s ire. “I had a lot to do with that,” Kelly told lawmakers, a statement that probably didn’t do him (or an immigration deal) any favors. In a series of tweets on Thursday, however, Trump seemed singularly focused on destroying everything his chief of staff had said about his immigration position. Specifically, he wanted to let his supporters know that, as far as the wall was concerned, nothing had changed. Later in the day, after reports emerged that Republicans were confused about what precisely Trump wanted to see in a piece of legislation, the president made it crystal clear. If there is no wall, there is no deal. It doesn’t get much plainer than that. Our secondary question, though, is whether Gen. Kelly will survive a day in which he seems to have severely disappointed the president. If the DACA deal is on thin ice, so might be the chief of staff.